The sound is definitely the only underwhelming part of this game. In the console version, the soundtrack is booming with whimsical and generic music that reminds me of those typical undercover TV shows like Starzky and Fitch. But in the 3ds the music isn’t played much, and mostly used for driving sequences when you jump in a car or beating up thugs. The rest of the game is remotely quiet, with just the bustling sounds of cars, and the birds chirping and etc. It sounds nice that you actually feel like you’re in a real city in Lego world, but I really do wish they would’ve played more music in the game. Another thing is the dialogue. On the Wii U, not only the cutscenes contain dialogue, but also the dialogue that occurs while you’re playing the game. When the characters interact with each other, or even when you pass them by, there’s dialogue and talking. On the 3DS, all the talking is kept only for the cutscenes, but during the game, the characters are silent with just the subtitles showing. This sacrifices a lot of the humor that was seen on the console version. And since there’s only a handful of cutscenes on the 3ds, the humor is definitely lacking. But that’s understandable, since the game had to sacrifice this in order to include all the open worlds and everything else. The graphics are pretty much decent to look at, for a handheld Lego title. It still isn’t HD standards, but at this point in the game that’s excusable, knowing that it’ll never reach a Wii U’s standards. Many critics have complained about the drawrates and framerates of the game, and mostly complain about the loading times, which are all exaggerated. Because this is a 3ds game, the depth of the graphics can only reach so far, and since this is the first lego handheld title that has open world and free roam, the city is presented with a foggy mist, to give depth to the game and prevent you from noticing the draw rates. This ends up working for the game, since the graphics have to load up as you’re approaching them anyway. This reminds me of a PlayStation 1 game and a Nintendo 64 game of the late 90s, where draw rates were not crystal clear, but it never affected the gameplay. Another gripe the critics had was the loading times, saying that it could take up to 2 minutes for a single level to load. Nothing could be further from the truth. First of all, this game has far less loading times than the previous Lego games, and only occurs when you’re going to a completely different location. Lego City is divided into several divisions. You start in Cherry Hills (where the police station is located), and as you progress throughout the game, you visit Albatross Island, Apollo Island, Downtown, Fort Meadows, and etc. These towns and areas are Very huge for a 3ds, and you’ll find yourself spending hours exploring 1 section. So it’s very understandable how another section takes quite a while to load, because this game isn’t divided into levels; the levels are integrated within the city. Furthermore, the loading times do not take up to 2 minutes at all. I’ve counted them several times, and they range from less than 30 seconds to 1 minute. I don’t know if it depends on what 3ds you’re using, but mine is a used handheld that I bought on Ebay, and its performance of this game is better than what the critics have described. Some of the best games back then had long loading times. I remember playing NFL Gameday ’99 on the PS1, and that game always had a loading time of about 1-2 minutes, but my friends and I always enjoyed playing it. This is definitely the part that was the strongest to me. The replay value in The Chase Begins is very high, and you’ll find yourself repeatedly going off task to look for collectibles and side missions. I finished the game’s story mode within a week, and that was barely 20% of the game I completed. One thing I love about this game is how it’s not just collectibles and extras that you have to collect; it literally feels like side missions! Even though you only play as Chase McCain, he goes through several disguises, from a robber, to a construction worker, farmer, astronaut, miner, firefighter, and a regular civilian who’s undercover. All of these characters get different missions. A robber has to look for ATMs to dissemble, and break in doors with a crowbar, a construction worker fixes generators and jackhammers through concrete, a farmer rounds up pigs and grows plants. An astronaut can fly with his jetpack and catches aliens among the civilians. A miner mines through crystals and sets explosives. And a firefighter rescues cats and puts out fires. There’s a lot more these different roles can do, which greatly expands the length of this game. And the best part is that there are several characters to purchase from the police station too, not to mention the different variations of your costumes. Another improvement of this game is the vehicles. While they’re not perfect like the Grand Theft Auto games, the steering has been greatly improved, and reversing your car is not much of a hassle. It’s better to control your car with the D pad though, rather than the joystick. The D-Pad gives much needed control to the vehicle, whilst using the joystick can be unresponsive and at times causes your car to veer off in the opposite direction than was intended. Rather than kicking out the driver when you carjack a random moving car like GTA, Chase McCain merely hops in the vehicle and immediately controls it, as if the car had been vacant before. Lego games have never been experts when it comes to combat, but the fighting in this game is very stylized and interesting, as you have to knockout your enemies in order to handcuff them instead of breaking them to pieces. There’s a lot of quick-time movements and counter-attacks too, just like Lego Batman 2 on the handheld, but much more improved. After a while, it does get a bit repetitive and bland, but one thing I do enjoy is that you can simply throw them off a ledge or building when you’re high up, and that takes care of them. 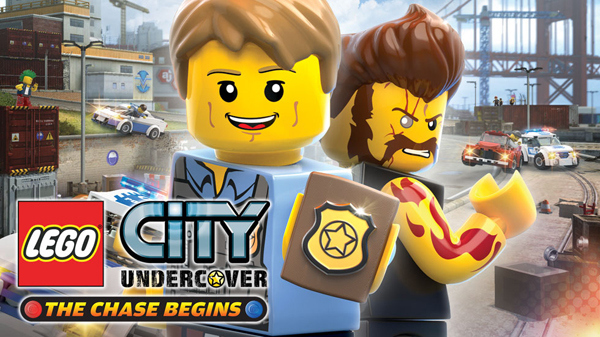 In conclusion, Lego City Undercover: The Chase Begins is very ambitious, and original for a 3ds lego title. I was surprised that I enjoyed it so much, and this is definitely one of my favorite 3ds titles, along with Super Mario 3D Land, and Resident Evil: Revelations. It’s been unfair how the game critics have directly measured this game with the Wii U counterpart, and I think they have been very biased and unfair with this one. If you’re a fan of Lego titles, and don’t have a Wii U, be sure to pick up this game on the 3DS. You will not be disappointed.